How good are 3D renders from office designers? An office fit out or refurbishment can be an expensive exercise for any company. What’s more, you will need to agree the costs for your updated workplace before it has been built. K2 Space design manager Chris Alldred explains how accurate 3D renders are, showing exactly how new office interiors will look before you put pen to paper on a contract. Apart from the handover of a new office to a client, presenting initial design concepts is the best part of my job. It is the first time that you can show what a refurbished office will look like. New partitions, furniture and carpet choices and the company logo on the wall in reception – it can all be included. The K2 Space design team uses drawing packages such as AutoCAD, SketchUp and Photoshop. 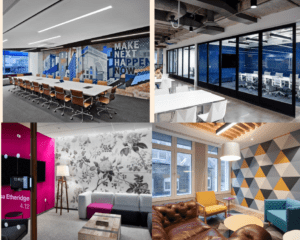 These are used to produce floor plans, sketches and 3D renders for clients – helping them to visualise their new workplace and also to make informed choices about their office fit out and furniture. In an initial meeting, we will listen to what the client wants and observe how their people use their current space. I pay attention to the existing workstation set-up. Then I’ll use a laser-level to get the office dimensions and use them to produce a floor plan. The floor plan will dictate the best office layout and usually the client is looking to maximise the efficiency of the space. It is not unusual to produce two floor plans, one for initial occupation and another with 5-10% more workstations, so the client can accommodate future increases in headcount. 3D renders really do bring an office interior design proposal to life for a client. The major furniture brands and carpet and lighting manufacturers all have CAD models of their products so it is relatively easy to incorporate them into any 3D render. The investment management firm was looking to incorporate a business lounge as part of an office fit out at its London office in Broadgate Tower near Liverpool Street. They chose to stick with the drop lights and the sofas from the original design and chose alternative bar stools for their bespoke breakfast bar. This office reception design was a great project to be involved in, the refurbished area shown below is very visible from Fitzroy Street, a busy part of advertising land. We came up with the idea for covering the meeting room glass with square graphics picking out Adobe products like After Effects and Photoshop. This design has also been repeated at other offices around the world. We helped app developer Nice with the fit out of their first established office space. As a young company, this was a significant investment for them and renders such as the one below, helped them to understand how professional their new workplace would look. The reception is a particularly striking feature of the space as it uses the company’s corporate purple as well as being part of the open plan area so giving visitors access to the sights and sounds of their office. 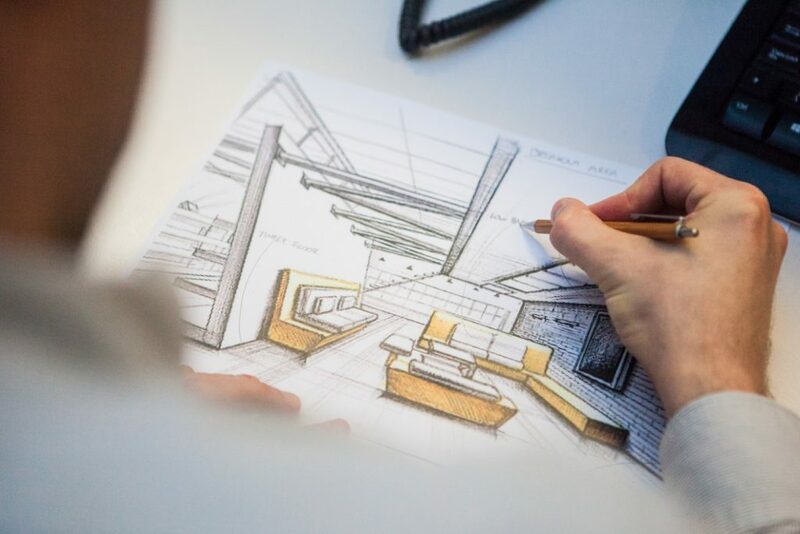 Read more about our office design services and how we work, while we have also created a short eBook looking at why office design matters – we hope you enjoy it.